Quantum Theory: Entering the "digital age" of physics and mind-over-matter. Quantum Theory and Quantum Physics help explain the relationship between Mind and Matter. As science continues to explore the true nature of physical reality, new subsets of physics - such as quantum theory, quantum mechanics, and quantum physics - arise in an attempt to explain the behavior of matter at subatomic levels. The purpose of Metaphysics for Life is to bring metaphysics and metaphysical science to your life in a form that can be practiced and applied. Therefore, I would like to use a metaphor from my own personal experience, to help explain how quantum theory can be used in everyday life. I started working in television production in 1989 as a producer, writer, camera operator, and editor. Although that was only 20 years ago, non-linear production technology was not yet available. Everything had to be shot and edited in a linear fashion. Today, digital non-linear information can be downloaded into a computer, placed anywhere along an editing timeline, and moved about at will. From my perspective, what digital technology did for video production, quantum science is doing for every area of the human physical experience. In a nutshell, quantum physics explains that matter is not made up of particles, but waves. That means everything we see, hear, touch, taste or smell is in reality a wave of information and energy. The implications for this are enormous and mind-blowing, if you take the time to think it through carefully. What quantum science shows us is that time is not linear, matter is not solid, and that the empty space between objects is actually a sea of infinite possibilities. It has also demonstrated the relationship between mind (the observer) and matter (the observed). Everything we experience in the physical universe exists in an ocean of infinite possibilities, coming into existence when the mind gives it form. Just as digital technology gave video producers the freedom to create in a non-linear fashion - saving enormous amounts of time and opening doors to infinite possibilities in digital animation and computer graphics - applied quantum science will give anyone with a mind access to enormous creative and productive potential. This is the exciting and inspiring future when cutting edge metaphysical science is studied and applied consciously and responsibly. Even if you are not a scientist, you can and will benefit from the many advances soon to be made in health, education, and technology, through the application of quantum theory to everyday life. 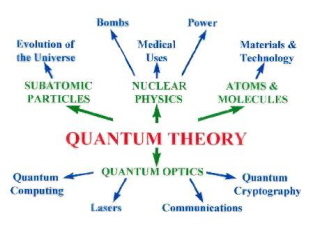 You can learn more about the science of quantum theory by clicking the resource links below. To read about the quantum nature of your mind, and how you can use that knowledge to understand and influence your reality, click here. Quantum Theory Project is the world's largest research center for theory, modelling, and computation of complex, novel molecular and materials systems. We focus on the subtle, profound interplay of chemical, physical, and biological realism, develop quantum mechanical methods, and implement them in innovative software. Founded in 1960 by Prof. Per-Olov Lowdin, we operate the world-renowned Sanibel Symposia. Our current co-directors are Erik Deumens and Kennie Merz. We are an institute of the Depts. of Physics and Chemistry of the University of Florida. Explore a variety of quantum theory definitions, and answer the question, "Why was the development of the quantum theory important?" The Wave Structure of Matter (WSM) and Spherical Standing Wave Interactions; explains Discrete Energy States of Quantum Theory - Wave Mechanics. A simple solution to the particle-wave duality of light and matter, EPR, non locality and quantum entanglement. This brief, non-mathematical introduction to quantum theory and relativity, modestly subtitled “a guide to the universe”, aims to “help ordinary people understand the principal ideas of 21st century physics”, and it succeeds magnificently, even though it deliberately sets out to challenge many of the assumptions that underpin our commonsense understanding of nature, and each chapter asks readers to believe three impossible things before breakfast. - Bill Thompson, New Humanist; The Magazine for Free Thinkers. How particles can exist in more than one place at the once.